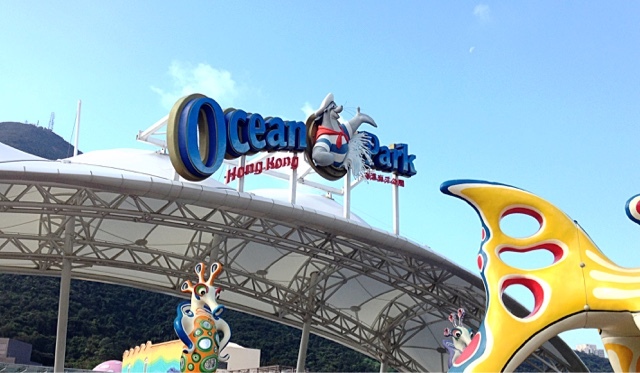 Hong Kong's Ocean Park is a well known theme park that does not require more introduction. If you are reading this, you probably already have plans to visit the place. So I will just give some tips to visit and enjoy your time there. The prices are Adult - HKD 320 and Child - HKD 160 if you purchase directly from the theme park. However, you can buy discounted tickets from CTS (China Travel Service) for significant savings (Adult - HKD 262, Child - HKD 131). It has many outlets in Hong Kong (list of outlets: http://www.ctshk.com/english/aboutus/images/branches.pdf) and you should be able to locate one conveniently. If not, you can also purchase online from CTS website, though you might need to read Chinese as it reverts to the chinese website for online purchases. Even though official opening hours are 10am-1030am, the main entrance may open a little earlier for guests to enter. You are still blocked at around Aqua City Lagoon area, which is the path leading to inner areas of the park, but many visitors will still enter and crowd around the area so that they can enter the attractions ahead of the main crowd. The park is divided into two main areas: The Waterfront and The Summit. The sights and museums are at The Waterfront where you enter from the main entrance. The Summit is where the theme park rides are. I will suggest going straight to The Summit for the rides first because there will be almost little to no waiting time in the early half of the day. Most of the tourist crowd comes in after lunch and by then you should have finished most of the rides. For reference, I went in on a Sunday and could still enjoy 0-5mins wait time for rides until as late as 2pm. Related to the earlier points, I would suggest taking the cable car ride from The Waterfront to The Summit and Ocean Express train on your way out, to avoid the crowd and waiting time. The cable car ride is worth taking for the scenery, although the queue can get very long, especially when the tourist crowd comes in. I am planning for a visit to Hong Kong on this summar. The tips provided by you is very much helpful for me.